With our Q3 2013 SP release of UI for WPF we are introducing a brand new mechanism in the RadDocking control, the ability to bind a collection of objects to the RadDocking control. The PanesSource property implementation is very similar to the ItemsSource one in any ItemsControl control and it can be even bound to RadPane instances as well. The PanesSource property can be set/bound to any collection of objects. Because you could set this property to a collection of for example strings, ViewModels etc. the RadDocking control needs a mechanism that tells it how to represent those objects in the control. This mechanism is the brand new DockingPanesFactory. This help article demonstrates the basic uses of the PanesSource and DockingPanesFactory with some commonly faced scenarios when using the RadDocking control. The PanesSource can be set to collection of any type of objects. The most common scenario that you would face is where you would like to bind a collection of RadPane objects to the control. In that scenario you will need to simply create a collection of RadPanes and set it to the PanesSource property. If the bound collection to the PanesSource contains objects of RadPane type the Panes will be added to new RadPaneGroups that are docked to the left. If that collection contains objects of RadDocumentPane type those Panes will be added to the currently active RadPaneGroup of a RadDocument or if such doesn’t exists to a new RadPaneGroup that is added to DocumentHost of the control. As you noticed from the above example when you bind a collection to the PanesSource of the RadDocking control the control itself knows how to render those objects in the context of the Docking control. That behavior is determined by the DockingPanesFactory of the control. The above behavior is the default behavior of this factory. 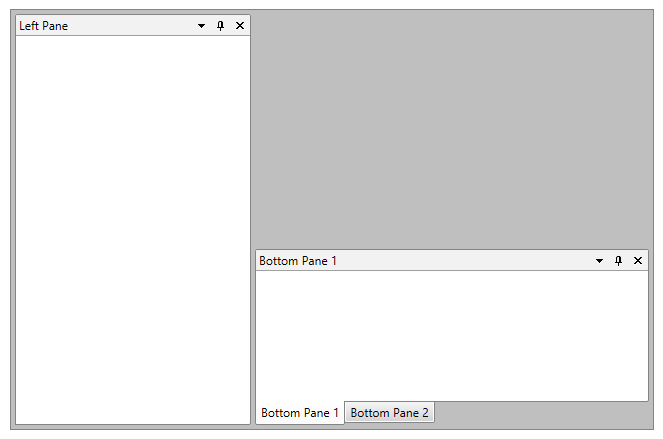 In order to achieve a different behavior for example to be able to add multiple Panes from the bound collection to a specific PaneGroup you can create a custom DockingPanesFactory and override its methods. AddPane Adds the Pane to the RadDocking layout. If there is no available containers to generate the new content please use the RadDocking's GeneratedItemsFactory to create additional RadSplitContainers and RadPaneGroups. CreatePaneForItem Creates a new RadPane instance for item from the PanesSource collection. Make sure to apply set any properties, styles and templates so that the generated RadPane may look properly in the RadDocking. GetPaneFromItem Gets the RadPane from the item parameter. IsItemItsOwnPaneContainer Determines if the specified item is (or is eligible to be) its own RadPane container. RemovePane Removes the Pane from the RadDocking layout. By default clears the Header, Content, DataContext and call RemoveFromParent method. With R2 2016 of UI for WPF an override for the CreatePaneForItem method that accepts RadDocking instance has been created. Using it you could easily access the instance of RadDocking inside which the Pane has been added to. You can download a runnable project of the previous example from our online SDK repository here, the example is listed as Docking / CustomDockingPanesFactory.